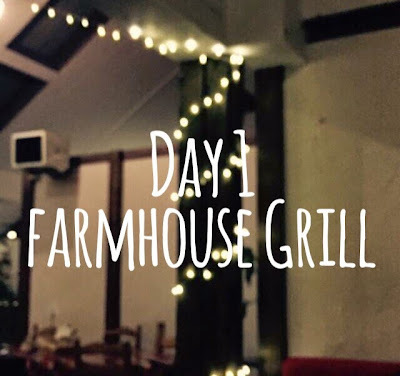 Baby Pebbles: Bluestone Series: Day 1: Farmhouse Grill! 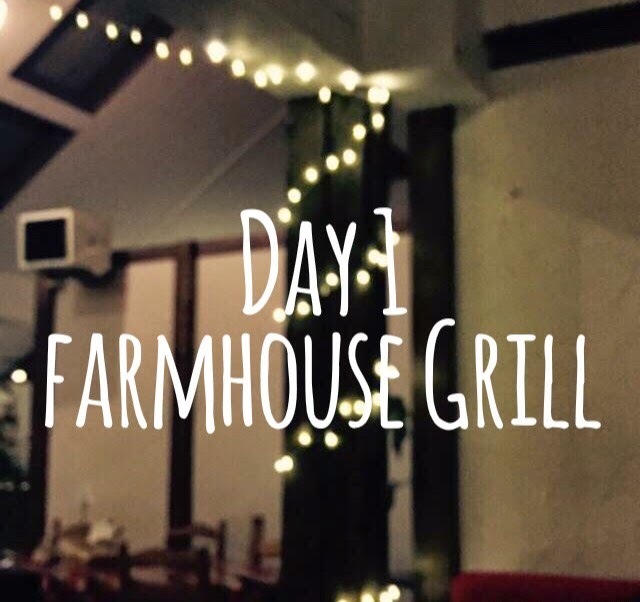 Bluestone Series: Day 1: Farmhouse Grill! Hi, welcome back to the Bluestone Series! Todays post is what we got up to on day one which was also arrival day! To see how our arrival and first impressions were (Click Here). As we arrived pretty late to Bluestone we didn't get to make much use of the facilities on the park nor look around to much but once unpacked and settled we did decided to venture into the village square and have a meal together. We chose to go to the Farmhouse Grill. I had read a few reviews from fellow bloggers and it hadn't been raved about so I didn't have high hopes for the quality of food or surroundings. I was actually pleasantly surprised. MY thoughts were that it was exactly what it said on the tin, a Farmhouse Grill. It was very barn like with the design of the roof, and the décor was very wooden country. A beautiful real wood fire and twinkling fairy lights on the wooden beams of the ceiling really set a lovely atmostphere for me. They had a children's food bar with simplistic food choices maybe not to all parents standards but lets be honest not many children are adventurous with food and there are other places to eat with more variations if you wish so I felt this to be fine. My meal was fantatic and I even said to our lovely waitress that it was superb. I had a three meal course, a starter of delicious liver pate with toasted fresh bread and a pickled chutney. For my main I had a 12o pork chop with mushroom, tomatoes and chips, the taste of my meat was sensational. I demolished the lot, and as I had the starter and main they had a deal on that you can choose a free dessert. I had the bread and butter pudding as id never tried it before. It wasent completely my thing as am not a big fruit in desserts fan apart from the odd apple crumble. But the portion was huge! and if it had been more suited to my taste buds I would've been delighted with such a generous serving. It was a little pricey but I had to justify it because aswell as having the deal we had got we also got use of the salad bar and fresh baked bread for free to dulge into. So for the price you do get a lot for your money. After dinner we went back to our lodge to wind down for the night, popped Penny in the bath, I had forgot to bring her bath seat and it would've been handy to have a bath mat supplied. As I would've had a little more control over the little one as she kept slipping from the bottom of the bath. Even for an older child and even older adults I like the safety of a bath mat. That's just my personal preference. We got ready for bed and watched a little TV together, it was so relaxing in the living area, all being so cosy, no phones, no disconnections, all just spending quality time together. It was lovely. Coming next: Bluestone Series: Day 2: Exploring & spa experience! Baby Activity: Jelly Pot Messy Play! Bluestone Series: How Our Trip Came About! When Is The Right Time For More Children?